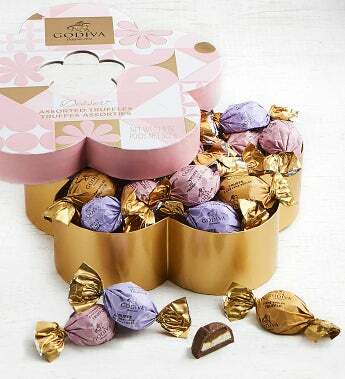 Celebrate this lovely season with a beautiful spring gift box filled with gourmet chocolate truffles from Godiva. The Flower Gift Box is adorned with an artistic pink and metallic gold design and filled with 32 individually wrapped chocolate truffles in three scrumptious flavors. With 12 Dark Chocolate Lava Truffles, 10 Crème Brûlée Truffles, and 10 Strawberry Cheesecake Truffles, this chocolate gift is a delightful way to impress family and friends! Gift measures 8.25" x 2.5" x 7.75"